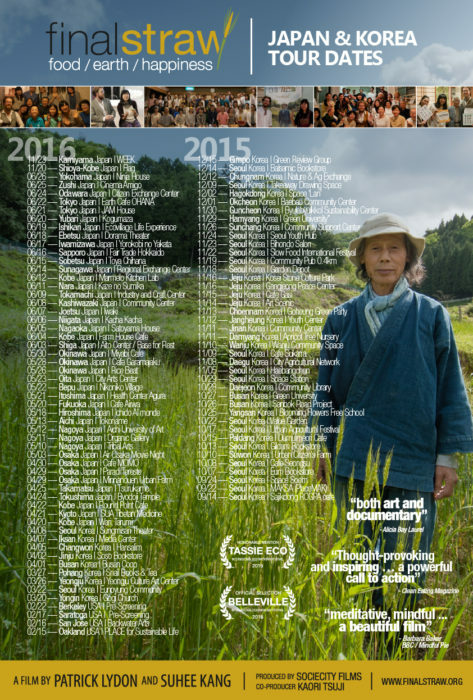 Final Straw’s directors Patrick Lydon and Suhee Kang toured the film extensively throughout Japan and Korea in 2015 and 2016, screening the film over 120 times. Like the film itself, the tour was entirely self-produced with our small team and with the help of communities and activist groups who volunteered throughout the regions we toured. The Japan tour was managed in-house by our co-producer, Kaori Tsuji, and the Korean tour managed by our co-director, Suhee Kang. It was physically and mentally strenuous work to arrange it, to lug all of our screening equipment around, and to greet and converse with a new audience each night, but at the same time it was immensely rewarding to see audiences inspired by the film, and to see the beautiful works of social and ecological wellness that are happening in cities, towns, and neighborhoods around this earth. Truly, there are many many more amazing acts of love, compassion, and community togetherness happening in this world than we see on the news! Although we sometimes travel to events when invited, we are on a break from touring the film, and have transitioned our efforts to building and operating a space in Osaka called The Branch, where we carry out work such as writing, short films, eco-artwork, and workshops, all done in the spirit of the film. You are welcome to visit us if you’re in town. If you’d like to host your own community screening, please visit our Screening Kit for more information. This page contains a listing of all official Final Straw: Food, Earth, Happiness tour dates. 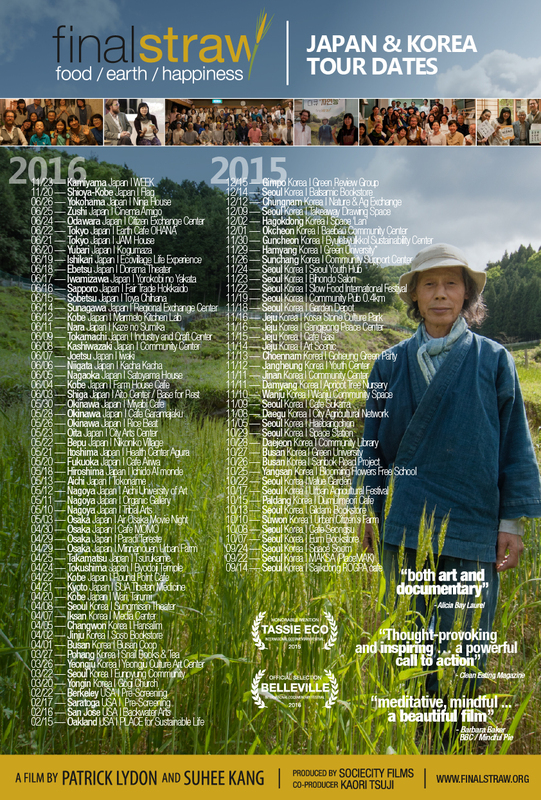 Unless noted, all dates include a post screening talk with the film’s directors. Dates for the Japan tour should be verified on the Japan Facebook Group. 10/26 — Busan, Korea | Cafe Sanbok St.